Even though she looks like an eccentric and flashy old woman, easily recognisable from her lilac-coloured hair and her big cat eye glasses, Dame Edna Everage is nevertheless one of the top ladies of the jet set. She is one of the greatest friends and advisors of Her Majesty the Queen and other world leaders. Moving around the world does not prevent her from loving her rural hometown, Wagga Wagga, and having a sweet family. Dame Edna has four children. To her despair, her youngest son Kenny is as gay as can be. Her husband, Sir Norman Everage, died from prostate cancer and as Dame Edna often reminds us, from "testicular murmur". As for her mother, she is now incarcerated in a "maximum-security twilight home for the bewildered". 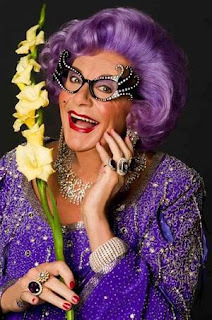 As surprising as it may seem, Dame Edna is actually a man. Mind you, he is not a transexual, but a regular drag… His real name is Barry Humphries and he is a stage actor. However, Dame Edna dislikes being called a fictional character or a drag, and claims that Humphries is only her "entrepreneur" or manager. Humphries has been Australia’s favourite comedian and satirist for the last fifty years. He likes expressing his outrageous viewpoints through his characters. Actually, Dame Edna is one famous character among many others that Humphries impersonates. Another popular one is Sir Les Patterson. To sum her up… Well, she does it better than anyone else : "I was born in Melbourne with a precious gift. Dame Nature must have stooped over my little bassinet and gave me this gift. It was the ability - the priceless ability - to laugh at the misfortunes of others."